It’s so hard to smudge it! Bravo, Maybelline this eyeliner is just wow and it looks like I’m not the only one who thinks so. Shade 02 "brown". Cat eye makeups... how difficult it is to do them, and the result is not always what you want to see. Of course, the quality of your lines depends on your tool. But it is not so easy to choose a perfect one - eyeliner pens may be too dry, and liquid ones often crumble and smudge. But as it turned out, the perfect eyeliner exists. Moreover, it’s available in any store. Shelf life - 12 months after opening. I picked the brown shade No. 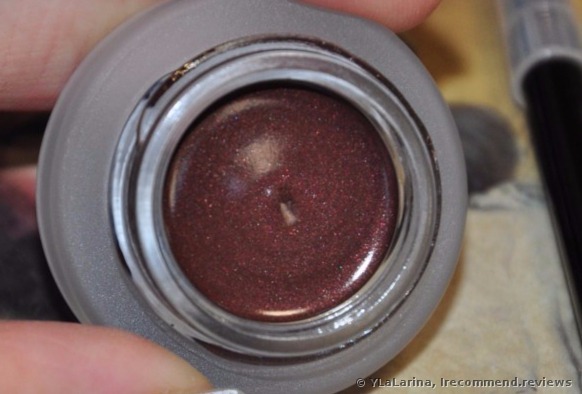 02 BROWN, this color suits me, plus I have black eyeliners from other brands already. The set includes a two-sided brush for drawing both thin and thicker lines. The sponge is designed for creating smokey eyes, but I'm a makeup newbie, so don’t expect a tutorial from me, for I can only amuse you by my inability to apply makeup. The product itself comes in a heavy glass jar, which is very tiny, and may slip out of your hands. The texture of the liner is gel, very dense, but it easily applies on the eyelid. I have absolutely no problems applying this product, even a newbie can do it without difficulty. I'm not a beginner, but I'm not a pro, I'd say I'm an amateur. I watched a couple of video tutorials and tried to follow along, but since all eyelids are different, it's not always possible to adhere to the classical technique of applying eyeliner, sometimes you have to make your own adjustments. And anyway, who can tell what is right and what is not. Draw you lines the way you like. The shade turned out to be sparkly, but they are not large, or vulgar, but noble and glamorous. In general, they create a gorgeous chic finish. 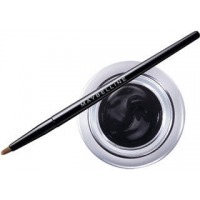 The eyeliner applies easily, you can create high-pigmented cat eye on the first try. You don’t have to brush along the eyelid for an infinite number of times. Your makeup is ready in a few minutes. But if your hand trembled and you made a mistake, for example, the tip of the winged eyeliners wasn’t sharp enough, you have to correct it immediately, otherwise the line will solidify and it will become very difficult to fix. Usually, I fix the lines with a cotton swab dipped in micellar water. It’s pretty economical and might last for a year, even if used on a daily basis. So I consider it a good investment. So, it lasts all day and does not slip off, which makes it a dream to the working woman. It won’t let you down. Personally, my eyes are constantly watery, but with the Maybelline gel eyeliner I'm sure that the makeup will not smudge and will stay on the eyelids. It removes not so effortlessly, but this is quite understandable, since the lasting power is phenomenal, so you have to use a makeup remover and then a micellar water. I recommend it, it’s the best eyeliner I’ve ever tried and it definitely deserves 5 stars! Hello there. I want to share with you my experience of creating wings on my eyes. Today I’ll show you 4 different types of them and I also will share some of my life hacks on how to make the process easier. Let’s get started. Hi, it’s me again This time I’m going to talk about the eyeliner that has totally won me over due to its color and versatility. I’m very careful with eyeliners be it liquid, gel or felt-pen eyeliner, because the product can both create a perfect makeup or ruin it. A mattifying Fit Me powder. I’m totally happy with the results, although I expected something worse. It’s the first time I gave 5 stars to the powder. + Fit Me Foundation.